Australian studio CplusC Architectural Workshop has extended a house in a Sydney suburb so that it looks like a doll's house with the back wall taken off (+ slideshow). 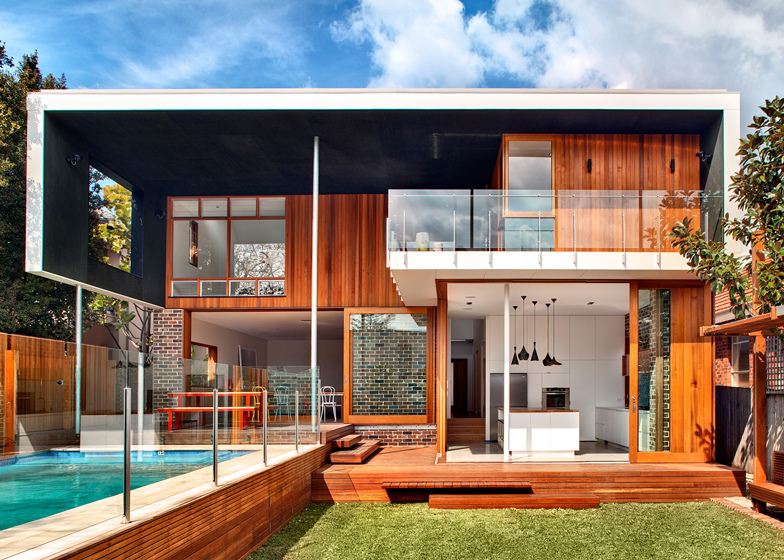 A new black-stained timber canopy creates a roof and side walls around rooms and terraces on the ground and first floor, while glass walls slide open to connect the living room and kitchen to the garden. The discarded timber beams of the house's original roof have been reused to construct the new family dining table, which overlooks an outdoor swimming pool. 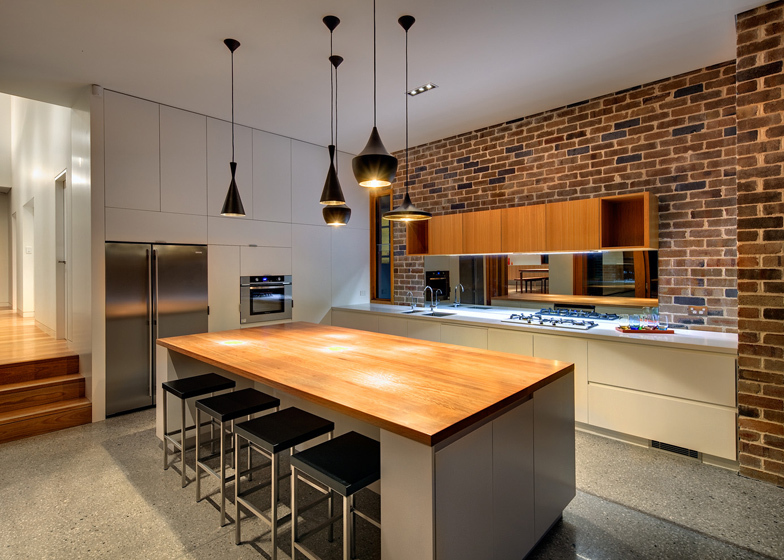 Reclaimed brick walls are exposed in the kitchen, where a cluster of pendant lights are suspended over a central breakfast counter. Bedrooms occupy the first floor and are shaded by the overhanging roof. 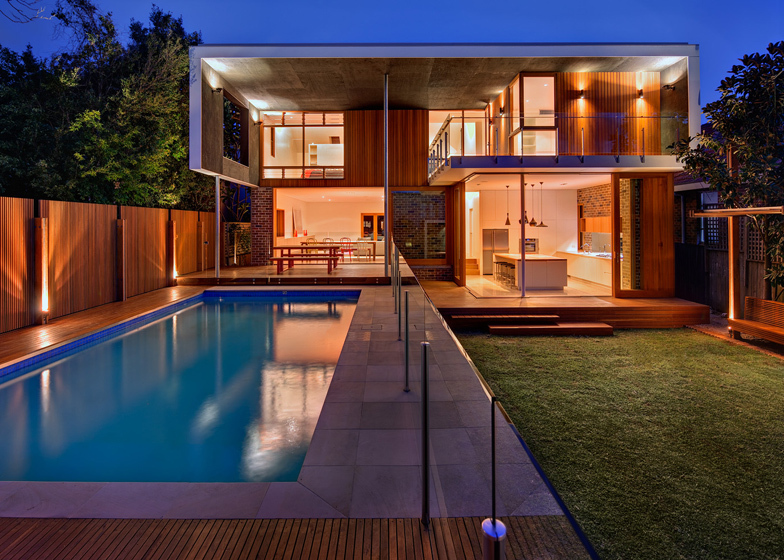 Located in the leafy suburb of Castlecrag, Sydney Australia, the natural beauty of timber is fundamental to the project, and embraces the ideals of Walter Burley Griffin’s design legacy for the area – “Building for Nature”. 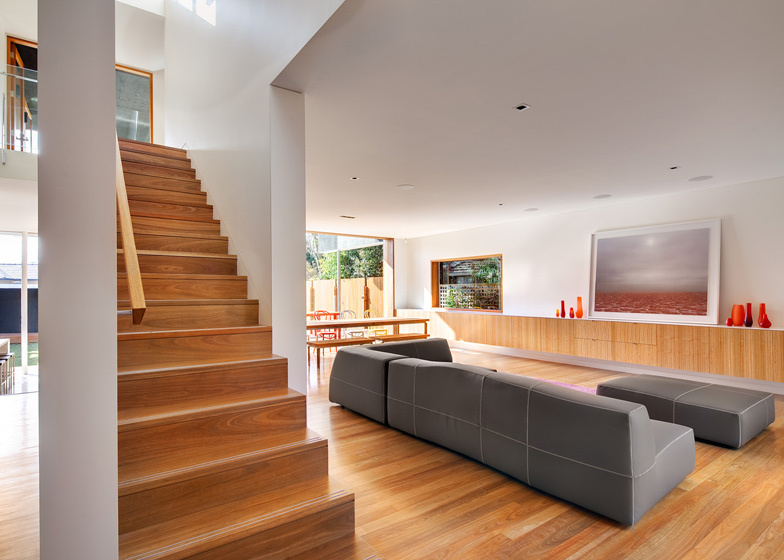 The home maintains its original presentation to the street, but is transformed internally from a cellular and inward-looking mid-20th century brick house to a contemporary, open and light-filled home. 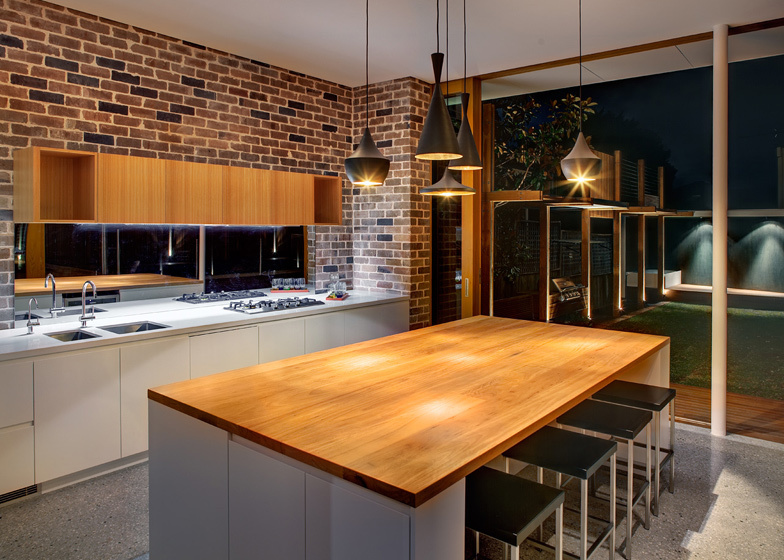 The kitchen is the pivotal room in the home, with Western Red Cedar doors disappearing seamlessly behind recycled brickwork allowing the internal living space to extend to a double-volume outdoor living space where Spotted Gum decking leads to the garden and swimming pool. 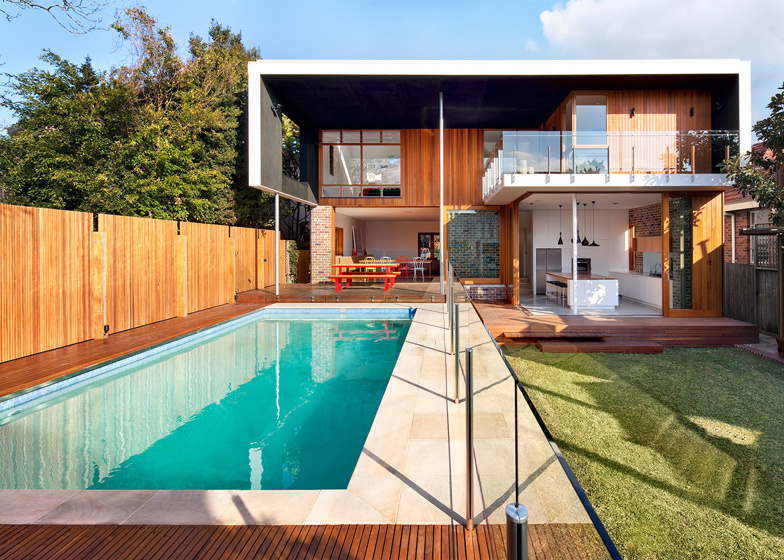 The external use of timber for seating, decking, fencing and screening terminates in a garden pavilion and transforms the yard into an intimate, peaceful oasis within a dense suburban context. 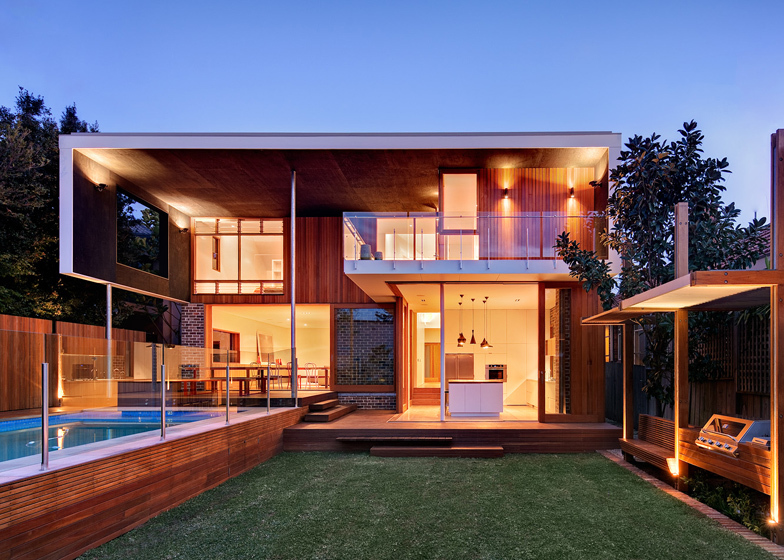 Both the functional and aesthetic qualities of timber have been drawn upon to heighten the experience of the home, and timber has been utilised in all aspects from structure and cladding, to internal finishes and external amenities. The rough-sawn plywood canopy to the North is stained black and acts a shroud for the first floor, screening the neighbours and focusing the outlook towards the garden. 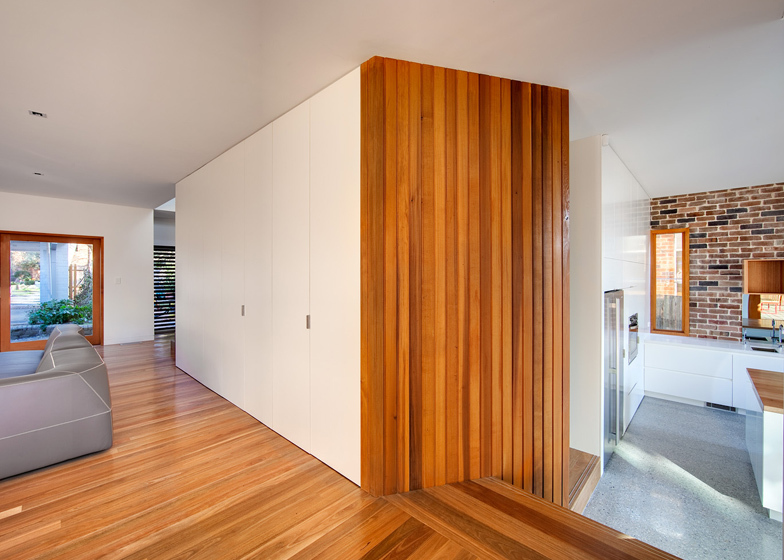 Plywood provides a neutral backdrop that allows the cedar cladding, doors and windows to be the focus of the home. The materiality of this canopy is mirrored in the garden pavilion providing a visual balance. 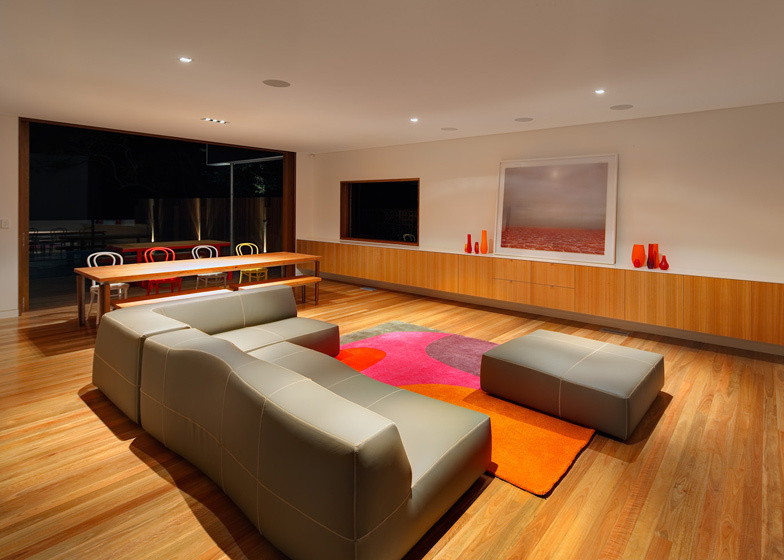 The cabinetry of the home utilises the efficiency of Australian hardwood veneer and corresponds with the laminated Blackbutt Island bench. Complementing the golden hues of the interior timbers is a custom Oregon dining table formed from the original roof beams, which has become the centrepiece of the home.